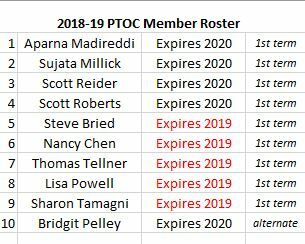 PTOC Member Application & Info. The San Ramon Valley Unified School District has been fortunate to receive generous support from the community since 2004 through voter approved parcel tax measures. Parcel tax funding provides a secure, stable source of revenue that the District can count on every year. This money stays in our local schools and cannot be taken away by the State. This renewal measure will continue to protect academic excellence in our schools by continuing the local funding our schools rely on every year. Career and technical training programs. The Parcel Tax Oversight Committee (also known as the PTOC) was established by the Board of Education of the San Ramon Valley Unified School District, pursuant to the passage of Measure "C" in 2009. The purpose of the PTOC is to provide oversight to ensure that such funds are applied only to authorized purposes as outlined in the Measure. The PTOC will continue to monitor the expenditures of the Measure "A" funds and will report on an annual basis to the Board and community on how these funds have been spent. In order to provide tax relief to senior citizens in the community, any parcel owned and occupied by a person 65 years of age or older shall be exempt from the parcel tax upon proper application to the District. Also persons receiving Supplemental Security Income (SSI) regardless of age, shall also be exempt upon proper application to the District. * Forms must be received by May 31st of the current year in order to qualify for the upcoming tax year (July - June). * You only need to file once forevermore. * No need to re-apply unless you move to another home within the district's boundaries.